First of all, you put on the white protective jacket and breeches, making sure to zip up and strap down securely. Next, you slip on the metallic mask, before finally picking up your blade and holding it firmly in your hand. Don’t be mistaken though, fencing was never a fancy costume party, nor an attempt to play out of any charming and romantic illusions about swordsmanship. You face your rival on the piste, and the moment the referee commands—“En garde (in position), pret ? (ready? ), allez! (fence! )”, a fever grips you both as each attempt to land a touché on the other, watchful for the slightest target opening. Fencing is a fight. You need speed, power and accuracy in your moves. You need the utmost concentration in observing the habits and weaknesses of your rival, constructing possible manoeuvres in your head, and adapting to the constantly transforming situation. In short, it is a combat sport with a great deal of both athleticism and intellectualism. Most will never have the opportunity to pick up this relatively unorthodox sport, but RI is one of the few JCs to offer it as a CCA. 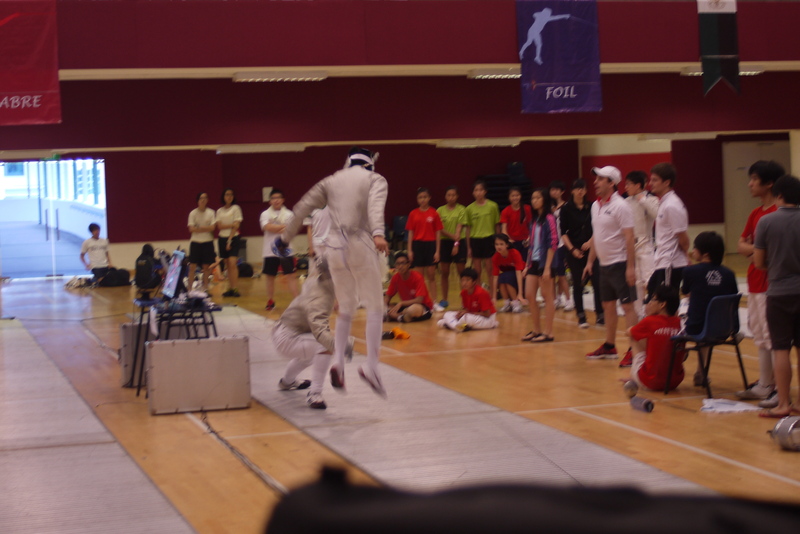 Training is helmed by Coaches Henry, Marin, Samson and Alex, some of them ex-national fencers, from one of the best fencing institutions in Singapore—Blade Club. The sessions are conducted twice a week on Tuesday and Thursday from 4.30pm to 7.00pm, and usually maintains a balance between drills, the learning of new tacticss and actual sparring bouts. The main goal each batch of Fencers advances towards is the inter-schools championships in April. However, marked throughout the calendar is a surplus of opportunities for RI Fencers to spar, such as the Novices Championships, school invites and non-competitive sparring meets. Besides that, Fencing gets to take on the task of running Raffles Invites during the December holiday each year. Behind the competition, which draws around a hundred participants, is an entire month of hard work, from the meticulous paper work, to banner and trophy designs and hours of “sai-kanging” together. At the end, when the crowd draws around the piste and follows the rapid action with keen eyes, emitting choruses of oohs and ahs and breaking into thunderous cheers for the neatly executed touches,there is the gratifying sense of accomplishment as a CCA, because you have brought about this meaningful learning experience for everyone. This is just one of the many gold nuggets fencers pick up and keep in their pockets as they go through the Fencing journey at RI. 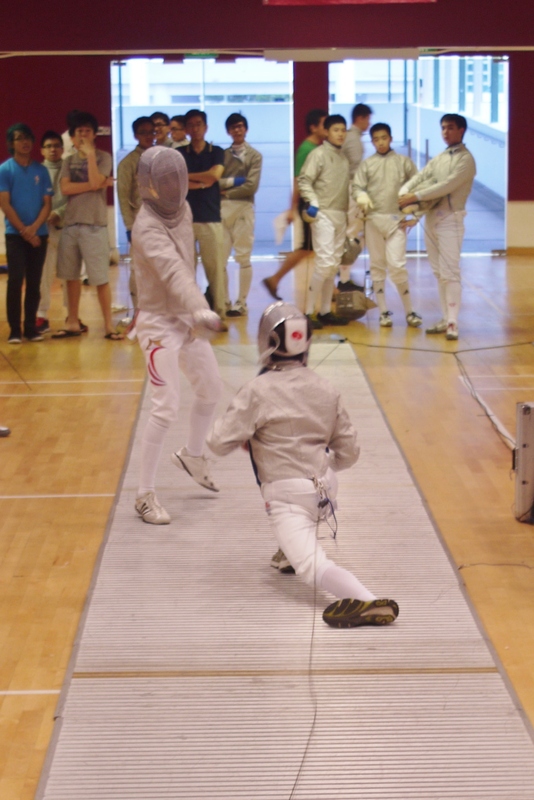 Nonetheless, there is one point which will make most people turn away from fencing: it is not easy to master the sport. What makes Fencing such a difficult, but intriguing sports, lies in the constant deception you create for your rival and at the same time, the penetration into the intentions and traps your opponent set up for you in return. The greatest thrill of the game comes from successfully deceiving your opponent, before thrusting your blade and making solid contact with the completely bewildered target, but that can only be achieved through experience and constant reflection after each bout. That is what Fencers do. Are you up to this challenge as well? The famous saying reads, “If you give a man a fish, you feed him for a day; if you teach him how to fish, you feed him for a lifetime.” Raffles Community Advocates (CA) believes that effecting real, positive and sustainable change in society cannot be fully accomplished through the offering of individual services alone. They strive to go a step further by identifying the root causes of problems, and from there, raise awareness to rally the support of the masses. Only then, can the change effected be meaningful and sustainable.